Snag a FREE personalized photo gift from Shutterfly today! 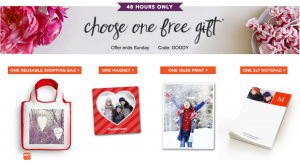 Free Personalized Photo Gifts – This weekend only, Shutterfly is offering up one of FOUR free personalized gifts —–> choose from a FREE shopping bag ($16.99 value), a FREE photo magnet ($8.99 value), one FREE 16X20 print ($17.99 value) or one FREE 5×7 notepad ($14.99 value). Just enter the promo code GOODY at checkout to grab one of these freebies. Easy 300 Calorie Cookbook is currently FREE (reg. $2.99!). 30 Aromatherapy Recipes is currently FREE (reg. $0.99!). Free Hair Care Sample – Head over to the SheaMoisture Facebook page to grab a FREE dual-sample packet of SheaMoisture Coconut & Hibiscus Curl Enhancing Smoothie! Act fast…this only available to the first 20,000 customers. Free Good Housekeeping Magazine Subscription – Sign up for aFREE two-year subscription to Good Housekeeping magazine. 70% Off Dollie & Me Sets – For a limited time, Zulily is hosting a Dollie & Me Sale with prices up to 70% off. New to Zulily? Sign up here. B1G1 Free Drink at Peet’s Coffee – Print the coupon here to score a FREE drink when you buy one at Peet’s Coffee and Tea. Free Valentine’s Day 8×10 Printables – Download three FREE 8×10 Valentine’s Day printables from Aileen Cooks. Choose from floral, chalkboard and ‘Always Kiss Me Goodnight’. Free Redbox Rental (Text Offer) – Redbox is offering up a FREE one day DVD rental (or $1.50 off a Blu-ray or game rental) when you text the word PUSH to 727272. You will then be sent a unique code that is valid onRedbox.com or in the Redbox app through Feb. 29. Free Burger – Jack In The Box is currently offering a new coupon good for a completely FREE Double Jack or Jumbo Jack Burger! Note: This coupon is available for the first million only. Simply fill out the short form and you’ll receive your coupon within 48 hours! Free Valentine’s Day Worksheets – Download a set of FREE Valentine’s Day tracing worksheets. Free Beef Jerky Sample – Request a FREE sample of Luther’s Smokehouse Jerky (offer is mentioned on their FAQ page). New customers can receive 2 flavors samples and returning customers can receive 1 flavor. Free Glad ForceFlex Trash Bag – Sign up for a FREE Glad ForceFlex Trash Bag. To get this freebie scroll down the page until you see the “request your special Glad bag” button. Free Printable Valentine’s Day Cards – Download a set of FREE printable Brown Bear, Brown Bear Valentine’s Day Cards. 10 Free eBooks: Easy 300 Calorie Cookbook, Aromatherapy Recipes & More!